Bad News - Cashing In On Christmas 7" version and Cashing In On Christmas [DUB/remix/12" version/whatever you wanna call it]. Play loudly! Is anyone else bothered by the fact that "PLAY LOUD!" is gramatically incorrect, or is it just me? The most crucial straight edge band ever releases the most crucial christmas themed album ever. 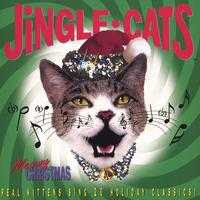 JINGLE CATS - MEOWY CHRISTMAS is http://boppeslag.blogspot.com/2007/12/jingle-cats-meowy-christmas.html. In anticipation of all the upcoming christmas posts here's the bootleg Jewdriver 7" (their half of the split LP with Jesus Skins - 500 pressed). Don't forget to light that second candle tonight. And pogo. One of my favorite shows, ever, was the time I saw Quiet Riot (2002 or 2003) at a tiny bar in Concord, California with 200 or so other people. It was a blast. They wore spandex. And did all their hits. There's no cause of death (apparently the guy was sober and straight). Extreme Noise Terror is here!! R.I.P. Mike Conley of M.I.A.